Cover of the summer 2015 issue. Click to read! 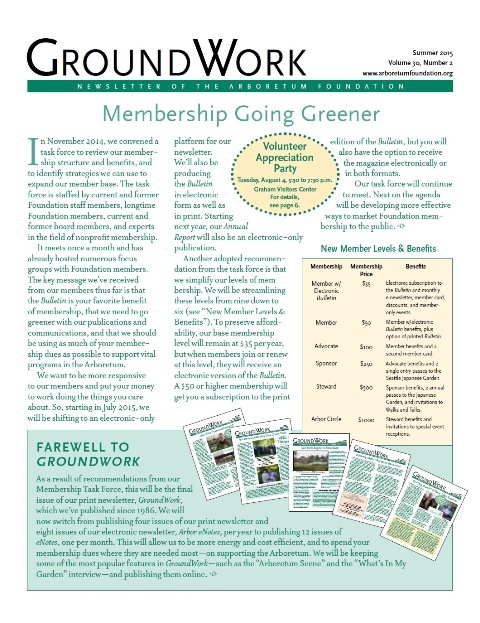 GroundWork was a quarterly print newsletter published by the Arboretum Foundation from 1986 to 2015. It featured the latest news about the Foundation and the Arboretum, and was mailed to our members. It was also available online and in limited supply in the lobby of the Graham Visitors Center. In summer 2015, to save energy and production costs, the Foundation discontinued the publication of GroundWork and transitioned to a fully digital platform, publishing Arbor eNotes once a month.